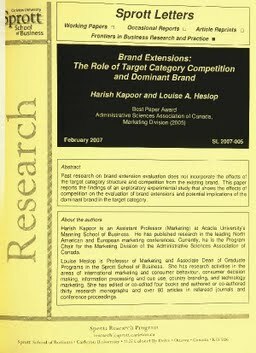 Past research on brand extension evaluation does not incorporate the effects of the target category structure and competition from the existing brand. This paper reports the findings of an exploratory experimental study that shows the effects of competition on the evaluation of brand extensions and potential implications of the dominant brand in the target category. Kapoor, Harish, & Heslop, L.A. (2007). Brand Extensions: The Role of Target Category Competition and Dominant Brand. Sprott Letters, February(2007).